To picture the eleventh sign of the zodiac, which in a natural birth chart rules the house of friends, the ancients used the figure of a Man. This man, with his left, or receptive, hand measures the influence of the heavens by means of a 24-hour gauge; while his right, or executive, hand is engaged in pouring down upon the earth, from an urn, the flood of wisdom thus acquired. Because Aquarius expresses the highest type of intelligence developed on the earth the Key phrase of this section of the zodiac where the Sun may be found each year from January 20 to February 20 is, I Know. It was long believed, and is now in process of being verified, that when the Equinox, which is the pointer of the Great Cycle of 25,868 years, just as the Sun is the pointer in the annual cycle of 365 ¼ days; when the Equinox should enter Aquarius, the sign of Knowledge, that the human race under that influence would make tremendous strides in science, in philosophy and in practical living. The Equinox moves backward through the circle of zodiacal constellations, not due to any movement of the Sun, but due to a wobble of the earth which causes the pole of the equator to move in a small circle about the pole of the ecliptic. The earth is known to have five major motions. It rotates on its axis, bringing night and day. It revolves in an annual orbit around the Sun, producing the seasons. The Sun, accompanied by the earth, is moving at the rate of twelve and one-half miles a second toward the dividing line between Hercules and Lyra. The fourth major motion is that of the whole Milky Way System, or galaxy, which is turning, like a pinwheel, about its center in Sagittarius. By this motion the Sun and earth traveling at the rate of 150 miles a second, take 240 million years to complete one orbit about the galactic center. The rate of travel of the fifth major motion, by which the earth, Sun and all the billions of stars of the galactic system are carried along, is as yet unknown. It will be seen that while the Sun, along with other suns, moves around a center in 240 million years, that this has nothing to do with the precession of the equinoxes. The precession is caused by the pull of the Sun and Moon on the bulging equator of the earth, which is not in the same plane as that in which the members of our solar system perform their revolutions. The gyration of the earth’s pole as the result of the pull on the equator causes the point where the Sun each year crosses the equator to move backward through the circle of stars. Signs of the zodiac are always just 30 degrees in extent. The constellations which picture the signs may be more or less than 30 degrees in extent Cancer, for instance, covering only about 15 degrees, while Virgo covers about 50 degrees. Furthermore, there being no exact record of the boundaries of these constellations, they are not well defined, but only approximate. When, therefore, the Equinox is said to have backed into the sign Aquarius, that does not mean that it has moved back to a point where some of the stars in the constellation Aquarius are located; because no one knows within a degree or two what stars should be included in the outline of the constellation. Instead, it means that the Vernal Equinox has moved back 30 degrees from the correspondence of the First of Aries among the constellations; because the sign Pisces (not the constellation Pisces), through which it has moved, by its very definition of being a sign, must contain 30 degrees along the ecliptic. As the whole cycle by which the equinox moves through the 12 signs takes 25,868 years, the date when the Equinox entered Aquarius by the back door and the Aquarian Age started could be determined precisely by adding one-twelfth of 25,868 years, or 2,156 years, to the date when the First of Aries among the constellations coincided with the First of Aries among the signs. 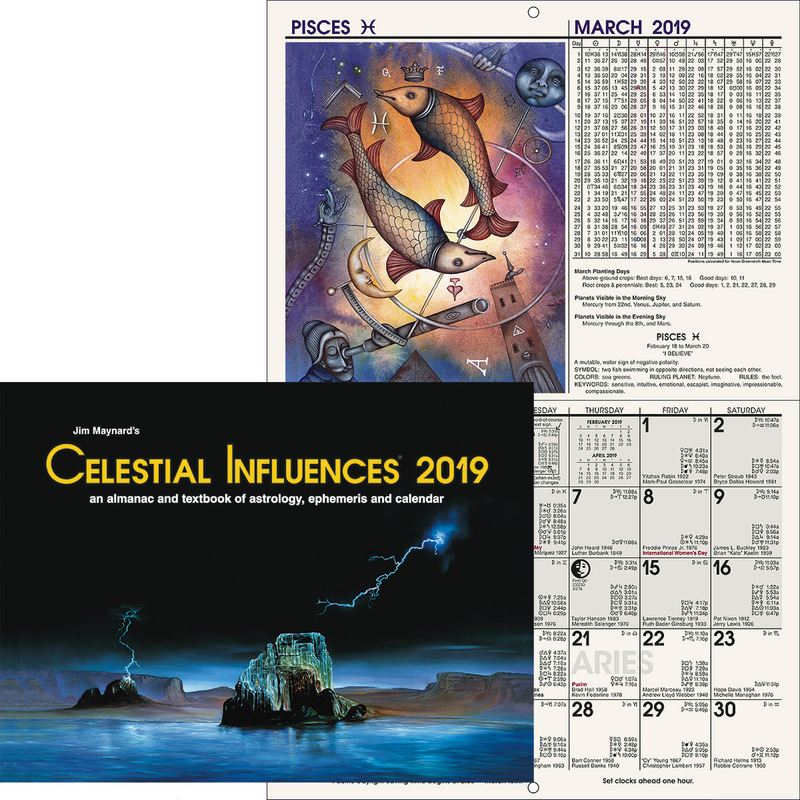 Unfortunately, there is no undisputed record of the date when the First of Aries among the constellations thus coincided with the First of Aries among the zodiacal signs. We cannot, for this purpose, elect the western boundary of the constellation Aries, because no one knows precisely where that boundary should be, or whether the picture as it appears on the maps of today is of the same size and contour as it anciently was. Thus there is no precise astronomical observation by which can be determined when the Aquarian Age began. It would appear, however, that the First of Aries among the constellations must lie very close to the most brilliant and conspicuous star in the constellation Aries. This star, Alpha Arietis, now has a Right Ascension of 2 hours, 3 minutes. That is, the Vernal Equinox has moved back not quite 31 degrees since it was on the meridian occupied by this bright star in the head of the Ram. Calculating at the rate of precession by Right Ascension, in 1881 the Vernal Equinox was just about 30 degrees along the ecliptic west of the meridian of Alpha Arietis, so that if this star be used as a starting point for the circle of constellations, the Equinox backed into Aquarius just about 1881. In determining the time of the commencement of the Aquarian Age, as it is mere assumption that Alpha Arietis is the starting point in the circle of stars, we are faced with a problem similar to that of determining the hour of birth of a person when the precise time has not been recorded. It is essentially a problem of rectification, such as all astrologers are familiar within their natal astrology practice. Within the time limits which for other considerations seem reasonable, the most satisfactory method of rectifying a birth chart is through the comparison of the events which have happened in the life with the positions found in the chart, and with the progressed aspects. And by the same token, rather than make calculations from Alpha Arietis, or from other equally uncertain starting points, it seems better to ascertain the commencement of the Aquarian Age from a consideration of events which clearly are not of the type which are characteristic of Pisces, through which for more than 2,000 years the Equinox moved by precession. Aquarius is a scientific sign, and during the past 50 years science has made greater advances than during the 2,000 Piscean years. Its ruler, Uranus, governs invention, psychology, electricity and the study of the stars. It has been within the past 50 years that the world has adopted electricity as an important source of power, that inventions have revolutionized industry, that astronomy has extended its boundaries from our solar system to the measurement of stars and other universes, and that psychology has come to be recognized as a subject that should be taught in our schools. 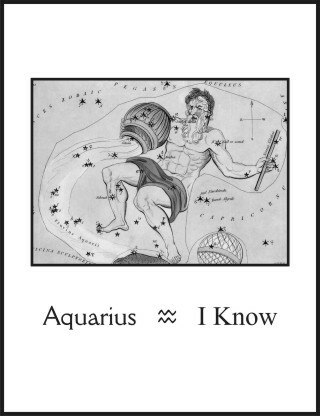 There is traditional basis also for considering that the Aquarian influence over world affairs started in 1881; but, as anyone familiar with Aquarius can hardly believe that present-day activities are actuated by the mere Belief of Pisces rather than by the Knowledge of Aquarius, to present other evidence would be to use space that can better be utilized in pointing to the most important developments which, now we are in the Aquarian Age, shortly will be with us. Because Religion forms the pattern of human conduct, its significance is even greater than that of the industrial and scientific advancement now to be seen under way. Science, which is classified information, gives power to accomplish. But whether that power will be used for the benefit of the race or will enable the few to subjugate and exploit the many, is a religious consideration. It depends upon the attitude toward life whether selfishness shall rule, or the humanitarian spirit which characterizes the finer side of Aquarius. Whether we like it or not, now that the world has moved into the astral current of Aquarius all institutions resting on a foundation of mere Belief will disintegrate. The orthodoxies of the Piscean Age are irrevocably doomed. Energy spent tearing them down is wasted, because their falsities already are disappearing, dissolving like the morning mists, faster than those who are enlightened can disseminate true knowledge to take their place. All the facts that material science has to offer must fit snugly into the religion of the Aquarian Age. Not that the unsubstantiated theories of materialists should be included; for fashions in scientific theories change as often as do the styles in women’s clothes. But all those things which have been proved a part of physical reality must be included. Yet in addition to the facts accepted by the materially minded there is a vast field of carefully verified truths relating to planetary influence, relating to the development and use of other than physical sense organs, relating to the conditions that are present after the dissolution of the physical body, and having to do with the basic purpose of life itself. This information also, however wide its range and varied its character, and regardless of its conflict with preconceived ideas, must fit smoothly into the Aquarian religion. All obtainable information must be organized into a single consistent structure and made practical in application. And as the zodiacal sign pictures a Man, this religion must provide man with the best possible method of meeting every contingency of his life. There is a best way to act under even circumstance wherein the individual finds himself, and this religion should be so comprehensive and yet so explicit that those who adopt it will have no difficulty in determining what is the best course of action under the conditions that confront them at any particular time. 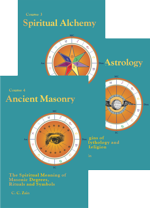 Because knowledge of astrology is essential as a guide to such best course of action, and because astrological relations, through their correspondence with things on the earth and within the mind are the avenues to the more comprehensive Knowledge required by the Aquarian religion, the religion thus formulated should be called The Religion of the Stars. And as this religion is based on that wisdom which expresses the Aquarian spirit of altruism, the text associated with the constellation is: Do and Think Unto Others as You Would Have Them Do and Think Unto You. A horse immediately suggests two things, speed of travel and ability to carry a rider. The head of a horse, the animal’s body missing, conveys the thought that the intelligence factor is to be considered rather than the physical propensities. To have Horse Sense is phraseology with which most people are familiar, even though it is not a refined expression. It indicates such a correct appraisal of circumstances that action of practical value can be based upon it. 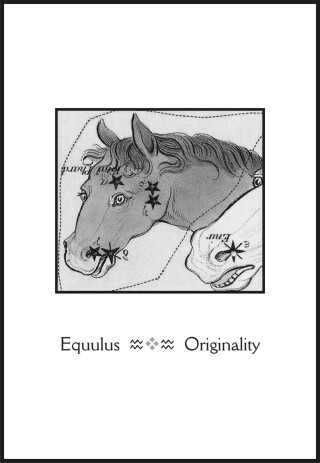 Yet the full significance of the Horse Head, Equuleus, as a universal symbol employed by the ancients to convey information, is not apparent until it is remembered that the sign Aquarius rules astrology, and that Equuleus pictures the astrology decanate of the sign. To be more explicit, the planet Uranus rules astrology, and the Aquarius decanate of Aquarius is specially under his dominion and thus has an unusually close affinity for the starry science. Furthermore, individuality and inventive ability, wherever found in marked degree, denote the Uranus or Aquarius influence. Hence the Keyword for this section of the sky where the Sun may be found each year from January 20 to January 30 is Originality. Those who feel that they have so complete a grasp of the laws and principles through which nature operates that nothing can transpire not explained by the textbooks used in formal education, jump to the conclusion that astrology is "exploded" merely because they do not perceive how it works, and because their teachers have so informed them. Yet such as so glibly proclaim there is nothing to astrology are free to admit—at least our foremost astronomers have thus admitted—that they have never tested the science out experimentally, and, in fact, would not know how to go about it to set up and read a birth chart. Utterly unfamiliar with the rules, and often attributing to astrologers claims to omniscience which no well versed astrologer ever makes, they merely echo what happens to be academic fashion. Horse Sense, which the general populace often possesses in greater degree than those who are bound by the tenets of formal schooling, demands that before condemning anything as untrue it should be tested out in actual experience. Theories are very fine, but the man in the street who has had numerous practical contacts with life, has come to realize that the accepted theories of the schools often fail signally in actual practice. He, therefore, is much less willing than the college professor to discountenance something just because he has no ready explanation for it. Following the dictates of experience, his Horse Sense informs him that the best way to find out if a thing works is not to theorize as to its possibility, or probability, but to actually test it out in practice. Thus we find a peculiar situation in our land; the so-called learned schoolmasters denouncing the public because, more and more, that public is coming to lean on astrology for help. And the public, in spite of the condemnation of the schoolmasters who depend merely upon theories in such matters, gaining more and more confidence in astrology, because they have had the opportunity to test it out through actual experience. If a thing actually works and is decidedly helpful, the man in the street is not unduly concerned whether or not it breaks the conventional traditions of scholastic opinion. Such gain in the popularity of astrology is made in the face of the unusually severe handicap that those who know almost nothing of the science, who are really astrological quacks through their flamboyant advertising are able to draw people into their clutches and give them misinformation under the astrological banner. Because the public has had so little opportunity in the face of academic condemnation, to become informed as to what can and what cannot be done with astrology and as to what constitutes a correct birth chart, or even that it should be progressed if the time and nature of events likely to he attracted are to be given, it is easy for rank charlatans to flourish under the pretense they are astrologers, and to fleece the public of money. This also makes it very easy for the academic upholder of conventional tradition apparently to disprove the claims of astrology. All he has to do is to answer the advertisements of those who for a dime will tell your fortune from the cradle to the grave. To these he gives his birth day and birth year, such seldom even asking for the precise data necessary to erect a correct birth chart. Then when he has collected a series of readings from these ten-cent advertisers, he has all the evidence he needs that astrology is false. He does have, it is true, plenty of evidence that those who advertise to give something of immense value for almost nothing are charlatans. But he need not go to the get-rich-quick pretenders to astrology to prove this. He could learn it from a dozen other types of get-rich-quick advertisements found in the same periodicals from which he obtains the addresses of the fake astrologers. But even with an array of such evidence he does not convince the man in the street, because that man already has learned that if he goes to a doctor, a dentist, or to any other professional man who makes exaggerated claims, and whose omnipotent services can be procured for a mere pittance, that he will be defrauded. He has learned not to expect something for nothing; and that in employing professional services of any kind it is necessary to consider reliability; and that those who have established themselves through merit do not advertise in the P. T. Barnum manner. Primarily the birth chart is a map of the astral body of the person then born. As a photographic negative bears the impress of light waves reflected from the thing photographed, so the birth chart pictures what the astral body of the individual then born contains. This astral body holds within its organization all the experiences and mental states that the soul has had up to the time of human birth; these organized into stellar cells and stellar structures which form the character. 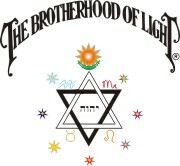 The astral body, which the birth chart maps, is thus a form built by mental and emotional states; and it is the function of the birth chart to convey to the astrologer precise information regarding these mental factors and their relation one to the other as affecting the abilities and character, and therefore the destiny. The relation existing between the most active, or dynamic, thought-built structures in the finer body, are mapped by aspects between the planets in the birth chart. Relationships that are thus so constant and powerful build a line across the astral form, from one group of mental factors to another, and this line, which is mapped by an aspect, acts as an aerial to pick up energies which are broadcast from each of the planets involved in the aspect. Thus are those more pronounced factors of the character supplied with additional energy from their four-dimensional environment. Whether that energy when received adds harmony to the astral body, or adds discord, is determined by the way the mental factors were organized, which is mapped by the aspect. Thus from a consideration of the character, which is mapped by the birth chart, it is possible to determine the natural abilities, and the normal trend of the events attracted; for these are shown by the organization of the character. This does not mean that the individual cannot develop abilities other than those shown in his birth chart; but that experiences before human birth already have developed certain types of ability, and he can utilize these natural talents with great ease. To develop qualities which are not shown in the birth chart requires great expenditure of energy, for it means building into the character qualities which have had no previous existence there. Furthermore, the birth chart, in mapping harmonies and discords, reveals whether or not the individual will attract fortune or misfortune if he engages in a certain occupation. 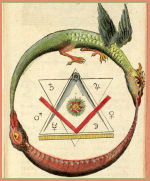 Thus it is the function of the birth chart to reveal not only the natural talents, but also under what surroundings the individual can use them to be of greatest benefit to himself, and to be able to contribute his utmost to the advantage of the world. When, according to definite ratios, the planets in the sky move forward to make progressed aspects, these release energies within the astral body of man in such a manner that temporary lines are built across the astral body. These lines act as temporary stellar aerials which pick up in unusual volume the energy broadcast from the planets mapped by their terminals. Whether the new energy thus picked up, radio fashion, and added to the thought cells of the astral body, are harmonious or discordant, and to what extent, is revealed by the particular aspect. As such stellar lines, or aerials, leading across the astral body, terminate in certain compartments of the finer form, each of which contains the thought cells relating to specific departments of endeavor, it can be known what phase of the life will be affected by this new energy, which gives unusual activity to certain thought cells. This does not mean that the individual shall submit to foreshadowed misfortune in this department of life; but it does indicate that unless he does something about it things will happen in a certain way. They will happen in the designated way because the four-dimensional cell life within the compartment receiving the additional energy will start working from their four-dimensional plane to bring events to pass that correspond to the way they feel, and in relation to their department of life. A progressed aspect thus indicates, not what will happen, but what will happen if nothing is done to prevent it; and it also indicates what should be done to prevent the event thus foreshadowed if the event is not desired, and what to do to get more benefit from the event if it is of a type which is beneficial. Common Horse Sense, such as is pictured by the Horse Head, Equuleus, demands that the individual shall take advantage of all knowledge which will enable him to make a greater success of his life. The text therefore is: Next to Love, Man’s Most Useful Companion is Knowledge, and in Particular the Knowledge of the Manner in which the Planets Influence Human Life and Destiny. The next decanate to the one which relates to the employment of horse sense is also pictured by the fore parts of a horse. The head, which implies intellect, is pictured; and in addition the front legs. Unlike those horses of earth which keep their feet upon the ground, this one also is equipped with wings. The intelligence which it represents consequently must be such as soars to other than physical realms. 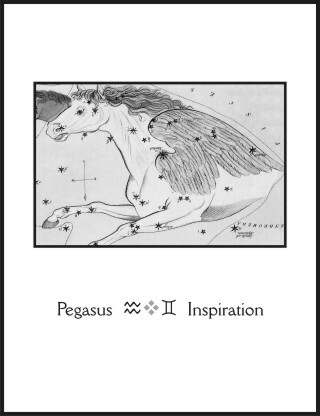 The travel decanate of Aquarius, where the Sun may be found from January 30 to February 10 each year, is represented in the heavens by famed Pegasus, the Flying Horse. When, according to the Greek story, Perseus had slain the Gorgon Medusa and cut off its head, he mounted on wings furnished him by Mercury, and sped homeward carrying the awful monster’s head. It was blood which dripped from this symbol of the imagination falling into the ocean, that is, imagination vitalized by emotion, from which Pegasus sprang; a powerful steed whose other name is Inspiration. All poets, it is said, before they can attract the Muse, first must drink at the fountain created by a blow from the hoofs of Pegasus. It seems that Pegasus in flying over Mount Helicon struck the ground sharply with his hoofs, and water instantly gushed forth; the sparkling clear spring of Hippocrene. Inspiration, which is the Keyword of the Gemini decanate of Aquarius, pictured by the Flying Horse, does not flow without a definite contact with the earth. That which the unconscious mind perceives, before it can come into objective consciousness, must be touched, or associated with, something already in the objective mind. Only through such physical association can it be externalized on the physical plane. Neptune is the planet which rules all forms of dramatic ability. It is related that Neptune tamed Pegasus and gave him to Bellerophon, son of the King of Ephyre, to aid him in conquering the Chimaera. This was a sea monster composed of incongruous parts, the origin of the word chimera, which signifies foolish or wildly fantastic creations of the imagination. If Neptune were to succeed in the production of high art, these incongruities of the imagination must first be slain. Pegasus, representing Inspiration, aided in overcoming such vain and discordant fancies, as he is said always to aid those whose work—poetry, painting, fiction, scenario or music—presents true dramatic worth. Such drama does not appeal directly to the intellect, but to the emotions. And the source of the ability to produce it lies not so much with the intellect as with a more primitive method of thinking which employs feeling rather than ideas. It is the method of thinking which, because it has been so long in existence, is employed largely by the unconscious mind. The use of well-defined concepts, such as commonly are expressed in words, is the last biological development of earth. It is confined to members of the human race. Such intellectual processes are not intimately associated with body states, but deal with relations through the use of special symbols that enable things to be examined and compared in the mind. These symbols permit of that type of mental activity called reasoning. Life, however, existed on the earth hundreds of millions of years before this type of intellectual endeavor developed. And all that time it was face to face with the necessity of successfully adapting itself to its environment. New circumstances continually arose, calling for correct appraisal of conditions, and for appropriate actions, if it were to survive. The protoplasmic cell coming into contact with something without itself which provided food or other advantage, experienced a feeling which in a more developed state we call pleasure. Coming into contact with an outside condition which tended to destroy it, there was experienced that which in a more developed state we call pain. The pleasure or pain experienced under any special condition resulted in action, more or less appropriate, which gave an advantage or led away from danger. The feeling also conditioned the organism, so that under the same conditions again it would move in the same way with even greater alacrity. Pleasure and pain not only stimulate to initial action, but establish a habit of moving in the same manner when the feeling is again present. The soul or character, which now occupies and functions through the body of a human being, has in its past organized and lived in association with, countless lower forms of life. Progressively it has learned to handle such forms, advancing from a simple organism to one more complex as it gained in experience, and therefore in ability. All of this knowledge, all of this ability, all of this mentality, which it has acquired through its entire progressive existence, is stored in the astral body, or unconscious mind. Since entering human life this unconscious mind has been in contact with the special symbols used in modern language. It has been trained for only a few short years in the employment of concepts, and in the process of reasoning. Such use of the intellect is a very late thing, something which has had opportunity to impress it for a matter of a few years only. The language of feeling, however, especially that expressed through the sympathetic nervous system, is as old as its first appearance in any life form on earth. The vegetative functions of the body, the regulation of the ductless glands, and, in fact, all but a few of our actions, are directed by the unconscious mind not through the intellect, not through the brain, but through the process of feeling. This language of feeling is that to which the unconscious mind has been accustomed for ages, and it employs other symbols than those modern ones which we term words. If, therefore, we are to tap the reservoir of the unconscious mind, instead of directing our attention to cerebral processes, we must learn to recognize and interpret the language of feeling. And the artist who, through any medium of expression, arouses appropriate response from others must be able to express himself in a manner not so much to intrigue the intellect as to appeal to the feelings, and this he must do by employing language which is recognized by the unconscious mind. To analyze, in terms of the intellect, a beautiful sunset or a musical melody; to pick it to pieces to discern its ingredients; is to destroy it. Such things appeal to the unconscious mind and use a language which by its symbolism arouses feeling. We are moved by feeling because for millions of years it was the only language which organisms were able to recognize. Therefore, if we are to make available what the unconscious mind recognizes, or what it may gain through its exploration of the unseen realms, we must not limit it to the language of intellect, to which as yet it is so unaccustomed, but must learn to recognize the language which it preferably uses. By all means, the critical function of the intellect should not be abandoned; for it is a necessary tool in clear-cut discernment of reality. But in addition, we should cultivate the ability to recognize the feeling language of the unconscious mind and to interpret it. To do this, attention must be paid to impressions, to feelings, and to symbols. When the unconscious mind is given to understand that dependence is being placed upon it to gather information, or to perform work, it will make an effort to do as required. It was accustomed for ages to being the exclusive agent for reporting to the organism conditions which were important to its welfare. But since it has organized a human form this function has been taken over almost exclusively by the intellect. It has formed the habit, therefore, of making no special effort to give reports or to gather information. But if this duty is turned over to it again in large degree, it will again become active, and can acquire knowledge to which intellect alone could never aspire. Through practice, the nervous system can be made sensitive to vibrations, and to the impressions through which the unconscious communicates with the conscious mind. If such states of feeling are closely watched, and their reports later checked against actual events and conditions, as often as possible, the feeling method of thinking will again come into use to supplement the intellectual method of thinking. The unconscious mind will then find an avenue through which it can impart whatever information it possesses, or can acquire, to the objective consciousness. Just how much Inspiration owes to what already is within the unconscious mind, how much to what it gains through astral travel, and how much to disembodied human beings on the inner plane, who communicate their thoughts, varies with the individual and with circumstances. Yet all three methods are open to the mind which habitually uses both intellect and feeling in its efforts. Those who lecture, or give messages from a public platform, often rely very largely upon the Inspiration they receive from the audience. The unconscious minds of all those present constitute a reservoir of information which is widely varied and of considerable range. If the platform worker is sufficiently receptive, the thought waves coming from the various members of his audience enable him to tune in rather fully on their unconscious minds. He thus has available for his use not only the information which they are aware of possessing, but vast funds of knowledge stored in the unconscious mind of each of which the individual possessing it has no objective knowledge. In addition to such mundane sources of Inspiration, those who become intensely absorbed in some subject, in their sleep, or voluntarily without sleep when they know how, frequently travel to regions on the inner plane where others are interested in, and engaged in investigating, very much the same thing. In this astral travel they have the opportunity to exchange news with others more advanced, and the information thus gained is brought back either consciously, or stored in the unconscious mind to be drawn upon as their feelings and thoughts, while the attention is directed to the subject, permit. The text is: Under Special Conditions, while Still Maintaining Physical Life, it is Possible for Man to Free Himself from the Physical Body, to Visit the Homes of the Dead, to Enter the Halls of Learning, and to Bring Back in Full Consciousness the Knowledge Gained in Higher Spheres. The legendary stories about giants such as Goliath, the Cyclopes and the Titans have their explanation in the zodiac in that point where the Sun reaches highest, the summer solstice; and their application to the life of man in reference to the ruthless use of reason and the development of selfish greed. These giants, however, are not pictured in the sky, but are known only through their relation to zodiacal position. They are destructive attributes which loom large upon the world’s horizon. Yet there is another attribute which is even more far reaching, which is still more powerful for evil, and which is even more difficult to vanquish than these various types of selfishness. Its common name is Discord. When the ancient wise men sought to picture in the heavens the force, or principle, which is most inimical to life, which attracts to man failure and disease, and which places the greatest obstacles in the way of progress, they looked about for some appropriate symbol. Because it is the emotional, or feeling, element which determines whether there is harmony or discord, and as water symbolizes the emotions, it was quite to be expected that they should select some creature living in the water. This denizen of the deep, as discord is a distortion of that which is pleasing and symmetrical, is required to be frightful and unnatural; and because it was to picture so vast an influence, it must be large as well as terrifying. 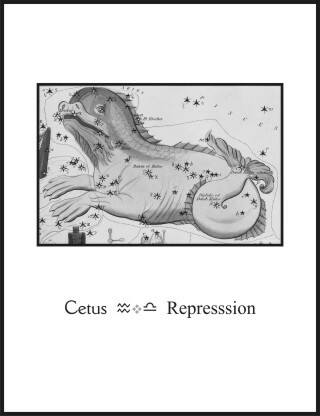 Cetus, the Sea monster, is such a creature, the distortion of a whale; and commensurate with the importance of the influence it represents, it has been made the largest of all the constellations. There are many sources of discord in human life. Planetary influence affords one important supply. Thus it is quite fitting that the universal symbol of Discord should picture one decanate of the sign which relates to astrological influences. The thoughts afford the initial supply of discordant energy to the finer form; and it is thus again appropriate that Discord be placed in association with the sign of the Man. From the standpoint of prevalency and potency there is no source of Discord in human life that can compare with that generated in the nuptial relations. Hence, recognizing that unions not based on love afford the conditions most favorable to building Discords into the astral body, Cetus was placed in the sky where it would picture the marriage decanate of the sign Aquarius, in which the Sun may be found each year from February 10 to February 20. Not in relation to the close association of marriage, which permits the discordant thoughts of each most readily to reach and affect the finer body of the other, but as indicating the general effect of Discord, the story of Jonah is enlightening. Jonah had been given certain work to accomplish which he feared to do. That he shirked doing it was bad enough, but in addition he also harbored the Discords of remorse. The emotional disturbance resulting is well symbolized by the sea which was whipped by a tempest; for Jonah had embarked on a ship in the endeavor to escape that which God had called upon him to do. When Jonah had been cast into the sea, a voluntary sacrifice to save the other men on the ship, the waters immediately calmed. Yet he continued in Discord three days, as indicated by the three days during which he remained in the belly of the Sea monster. If Pisces, in which the Fish swim, be considered the sea wherein Jonah was thrown, the Sun must pass through its three decanates after the one pictured by Cetus before it reaches Aries, where the water comes to an end. When Jonah, after suffering from the Discord of a disturbed conscience, resolved his inner conflict by deciding to do that which he deemed to be his duty, he was released from the belly of the Sea monster; that is, he was freed from Discord. In the story of Andromeda, it was the boastful pride of her mother, Cassiopeia, that placed her in a position of distress. As so many in the world today are not responsible for the Discord which has overtaken them, so was Andromeda the victim of her mother’s scheming ambition. The rock to which she was bound represents the materialism which demanded the sacrifice of her own spiritual aspirations to the false ideals of her associates. Here we are concerned with Andromeda only to note that the Sea monster, Cetus, who was sent by Neptune to devour her, is the type of monster which today destroys so many of our youths and maidens. It represents the Discords engendered, and fed from one person into the finer body of the other, when marriage is not a mutual love union, but a matter of material expediency. She was saved from this horrible death only by the arrival of her own Prince Charming, by Perseus, who loved her tenderly and made her his bride. That is, it was the harmony of true love and rightful marriage that saved her from the destruction of Discord. On all planes of life Harmony is Life and Discord is Death. The health of the physical body is determined by the amount of harmony between the dynamic thought structures of the astral body. The vibratory relations of the various thought organizations, one to the other, within the finer body reproduce themselves as functional and organic strength or weakness within the physical form. Thus it is in Stellar Diagnosis, to determine the predisposition to disease, the birth chart is examined for its heaviest Discords. The most powerful Discord in the birth chart is always the disease toward which there is the most pronounced predisposition. That is, the most powerfully discordant aspect in the birth chart maps the most pronounced discordant relation between the thought groups within the astral body. That such aspects thus reveal the diseases toward which there is a predisposition is not a matter of theory, but something which has been learned through the statistical study of thousands of birth charts. The charts of 100 persons who have suffered from each disease are collected. Always there are similar pronounced discordant aspects in all the charts. These when tabulated in terms of percentage reveal the Birth chart Constants of the particular disease. This does not signify that any person in whose birth chart these constants appear will inevitably suffer sooner or later from the given disease; but it does indicate that people who do not have these Birth chart Constants in their charts will not have the disease; and that those who do have them will need to exercise precaution if they are to escape. Precautionary measures usually can be taken to prevent the development of the disease; but if its Birth chart Constants are present, that person has weaknesses in his astral body which are reproduced in his physical body that will cause him to have the disease under conditions where another person not possessing these Discords would escape. In such statistical work, in which the Discords within the finer body are determined which enable a given disease to manifest, the chart is also Progressed for the date when the disease first was noticed to be present. In this manner, using charts of 100 persons suffering from a particular disease, the temporary Discord that enables the disease to develop is also learned. This progressed aspect, which manifests as a temporary stellar aerial which picks up and adds additional discordant energy to the cells of the astral body that relate to the disease, then tabulated in terms of percentage, is called the Progressed Constant. When the birth chart contains the Birth chart Constant of a particular disease and a time arrives when the Progressed Constant also is present, this warns the individual that he must use exceptional precaution to avoid conditions under which the disease commonly develops, and that he must use initiative to develop energies within himself, and conditions within his environment, which will prevent the disease from getting a foothold. It is one of the functions of astrology to indicate just what the danger is, when it will be most prominently present and what should be done to prevent the affliction which the Birth chart Constant and the Progressed Constant indicate is likely to develop. Disease of the physical body is only one type of affliction to which man is subject. Yet all the other afflictions such as financial loss, business failure, loss of loved ones, antagonisms from others; whatever misfortunes to which the individual may be heir, in a similar manner are mapped by Birth chart Constants and Progressed Constants in his chart of birth. These constants thus mapped, which show the nature of the misfortunes to which there are a predisposition, and the times when they are likely to develop, map specific Discords within the astral body. That is, whatever ill befalls the individual is always attracted by specific Discords within himself. And if he would free himself from them, even as Andromeda escaped, he must reorganize these discordant energies into harmonies. These birth chart aspects and progressed aspects merely map mental factors in the astral body; they are not the cause of the Discords. Furthermore, not only do the thoughts and feelings which originate with the individual have a power to build thought structures such as attract good fortune or misfortune, but the thoughts and feelings of those with whom rapport is more or less completely established also feed similar energies into the finer form. In the married state husband and wife are so closely associated that the thought energies and emotional energies of each find ready access to the astral body of the other. Thus they give each other mental treatments under the conditions of a close association which is most favorable for making the mental treatment effective. The avenues are open for the most ready exchange of finer energies. Nor does the mere avoidance of marriage prevent the development of Discord. The basic urge for reproduction is so strong a factor in all normal life that the attempt to stifle it commonly leads to that form of Discord denoted by the Keyword of the decanate, which is Repression. Yet if marriage is to be beneficial the energy exchange must be harmonious. Hence the text is: The Monster Which Demands the Sacrifice of the Fairest Youths of the Land is Discord in Marriage.